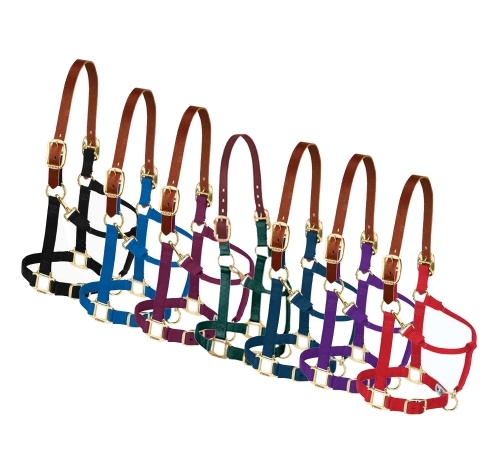 Weaver Leather Breakaway Original Adjustable Chin & Throat Snap Halter, A soft, supple burgundy latigo leather crown is the perfect addition to the popular original nylon halter. 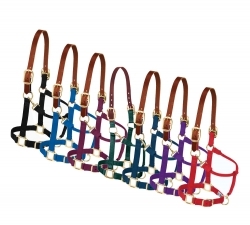 This convenient breakaway halter features a 1" nylon construction, oblong buckle holes, box-stitching at stress points, a comfortable rolled throat and true-to-fit sizing. Also features brass plated double crown buckles and a sewn-in, non-rust solid brass throat snap. Average horse or yearling draft.